From the black & white era, the history of film projection has come a long way to the point of high-definition visuals we enjoy today. IMAX is one such marvel from technological advancements, providing us maximum quality since it has the capacity to record and display images of greater size and resolution than conventional film systems. In India, a few cities like Mumbai, Bangalore, Hyderabad and Ahmedabad are already enjoying IMAX with Chennai having a long wait. 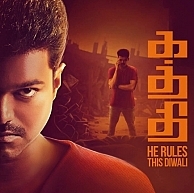 The sensational news is that, the Lyca produced, AR Murugadoss directed, Vijay starrer Kaththi will be an IMAX release as well, for this Deepavali, in countries like Netherlands. Details on the exact IMAX screen count will very soon be furnished. This is definitely a great start for team Kaththi and also the Tamil film industry as such. It is a dream come true for a cinematographer like George C Williams to get his work projected through the best possible technology available. But it is a disappointment for people in Tamil Nadu for missing out on a chance to see a film like Kaththi in such a format. The lucky NRI fans out there ? Get ready to see your favorite hero in IMAX ! Will the debut's standard be met again?? People looking for online information on AR Murugadoss, Ilayathalapathy Vijay, Imax, Kaththi, Kaththi Imax, Lyca Productions, Samantha will find this news story useful.